With approximately 132 million streams, it comes in miles ahead of Post Malone's previous record. Drake's Scorpion is breaking records one day after release. The double album, which features 25 tracks from the Toronto rapper, has reportedly shattered the opening day streaming record previously held by Post Malone's beerbongs & bentleys. 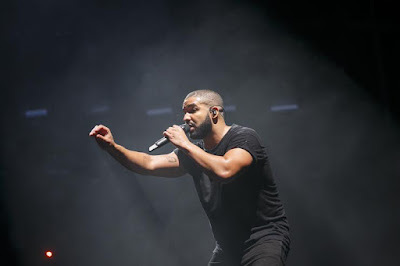 According to Music Business Worldwide, who has tabulated stats based on SpotifyCharts.com, Drake's new project has earned approximately 132 million worldwide streams in its first day, which puts it miles ahead of Malone's 78 million. Scorpion currently occupies the top 23 spots on the Spotify U.S. song charts. It holds the top 12 spots on the worldwide charts, with XXXTentacion's "SAD!" interrupting at No. 13 before 5 more Drake songs appear at No. 14 through 18. According to the same report, it appears Drake has also broken the record for most first-day singles streams worldwide as "Nonstop" earns approximately 9.2 million streams, putting it above Taylor Swift's "Look What You Made Me Do." It has fallen short of breaking the global single-day streaming record set by XXXTentacion's "SAD!" following the rapper's death earlier this month. However, it has reportedly set the record in the US. The large Spotify numbers come as no surprise after it was announced that Drake would be featured in a Spotify takeover where he appeared across a large number of playlists. On Friday, Spotify reported that the album was accumulating 10 million streams per hour.